This is not strictly true, it concerns creatures of all kinds but monsters - things that frighten - things of supernatural origin - figure large in its content. All the creatures contained herein can be used to populate Legend scenarios and campaigns. Within these pages, you will find bipedal foes such as humans and trolls, giant creepy-crawlies of all descriptions, monstrosities of the scaled variety, beasts from common myths and legend, and even mundane mammals from a variety of cultures. 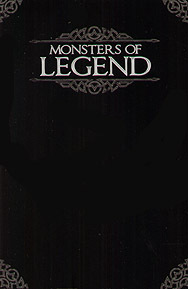 Monsters of Legend requires only the Legend Core Rulebook. Arms of Legend may prove useful but is by no means essential.